Bamboo can be grown in a large part of the US. The easiest area is in USDA Zones 7 and 8, but it has been grown as far north as zone 4. 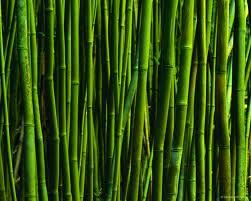 Bamboo is a forest grass and as such likes humidity. Bamboo grows best with lots of rain in summer, less in winter. Most bamboos do not like saturated soils. They are not swamp plants. Bamboo grows best where winters are mild and summers warm and moist. If your soil can grow corn, it can grow bamboo. After saying this, the farm I saw today is in Northern Calif. with wet winters and dry summers. Bamboo plants come in many varieties, but the big thing you have to be aware of is the clumping and the running varieties. The clumping stays in one area and do not expand rapidly. The running varieties send out runners and will rapidly cover large areas. Bamboo plants have many uses, one for area denial or to make a thick impenetrable barrier. Some varieties are extremely fast growing. I saw one today that grows two feet a day. Uses include using the cut and dried stalks to build fences, furniture, fishing poles, frog spears, and musical instruments. I even saw a bike frame made from bamboo, and yes, the bike could be ridden. So use your imagination. If you live in the right area, it is a plant that bears investigation; it has many possibilities. This entry was posted in gardening, Operational Secrecy, self defense, Shelter and tagged bamboo, Howard. Bookmark the permalink.